Today’s card uses a host set out of the annual catalog called Very Vintage. This set includes several vintage images and contains 10 total images. Here is my card based on the Cased card (also pictured) shown on page 7 of the Sale-a-bration original catalog. I also used All My Love DSP. As you can see, this paper can be used for more than Valentine’s day or Weddings. I used lovely Lipstick ink and ribbon. Join us on the CASEING TUESDAY Facebook page. Search the above. Also, there are new Sale-a-bration products you can get for free. Here are pictures of a Twist Pop-Up card that I made for Valentine’s day. It was really fun to make and they are so popular right now. The panels are 2 1/4″ and decorated with various StampinUp products such as die cuts, stamps and designer series paper from our new Sending Love Suite (small envelope with insert, stamped image saying Happy Valentine’s Day and dsp & ribbon on the card base.) from our occasions catalog. Also used was the Sunshines Wishes Thinlet dies (the heart on the front and word love, which coordinates with the stamp set of the same name) which is in our Annual Catalog. Another great set I used was the Blooming Love Stamp Set (the fancy heart on one of the panels, which also has a matching die set called Blooming Heart) which is also in our annual catalog. One last product used from our annual catalog was the Hearts & Stars Decorative Mask (first panel on the left). The card base is 4 1/4″ by 11″ and Real Red was used along with a black mat and Whisper White. Real Red and Black Ink was also used. We have inks, paper, ribbon, embellishments, markers and DSP that coordinate in color and design for the 50 colors that we have. If you would like to try your hand at making this card and need directions, please leave a comment on this page and I will send you some. For those of you that would like a copy of the catalogs mentioned (and you do not currently have a StampinUp demonstrator) you can also leave a comment or email me at darstz@hotmail.com. If you would like to place an order for any of the items, please visit my online store at darleneseitz.stampinup.net. I will end with two last Valentine’s cards made with the Sending Love Suite of product. January Paper Pumpkin Kit, Adoring Arrows, were these cute treat bags. There was enough supplies to make 24 bags. The kit included everything you need to complete them excluding scissors. A full set of stamps, ink spot, adhesives, metallic thread and all the paper material to make the bags and arrows. The kit is such a great deal and comes with instructions and there is a You Tube video on how to make the project. Sometimes it’s cards, banners, wreath, treat bags/holders and who knows what it will be from month to month. You can buy the kit two ways. One way is a prepaid subscription where you can buy 1 month, 3 months, 6 month or 12 months. 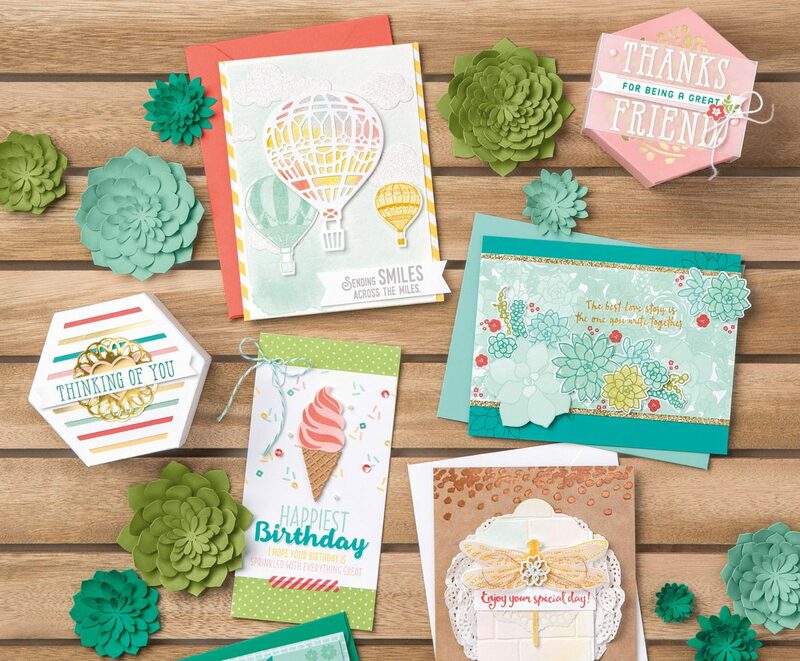 Right now StampinUp is running a special on the 3 month subscription for $55 in lieu of $59. To sign up for a subscription just go to this link http://darleneseitz.stampinup.net and click on Shop then Paper Pumpkin. Also when you purchase at least a 3 month subscription, you’ll receive a free item of your choice from our Sale-A-Bration catalog. This deal will last until March 31, 2017. In fact, you can receive a free item for every $50. that you spend. Please see my blog regarding SAB, here is the link in case you want to check it out: https://stampincardsncrafts.com/2016/12/29/2017-occasions-catalog-sale-a-bration/ .You can also purchase the kit on a month to month basis, for this you can sign up at http://www.paperpumpkin.com. Be sure to pick me as your demonstrator (Darlene Seitz number 2096764). If you do not want to make the entire craft, you can usually make some cards with the materials (or if you have left over material). These are the cards I made from some of the material. I did add some of my own materials. But, if you are an active Paper Pumpkin subscriber with me, I will send you some additional materials, pictures and instructions to make some cards that I have created. There are so many different cards you could make. Just let your imagination take over. December Paper Pumpkin kit (a monthly craft kit by StampinUp) is called Another Great Year and contained contents to create a mini scrapbook around your memories from 2016. I decided to use some of the supplies to do a regular scrapbook page. There are enough supplies left that I can still create a mini scrapbook or make some cards from the supplies. The supplies included a rotary stamp, a stampin write marker, washi tape, paper supplies to create the pages–double-sided patterned paper, window sheets,– silver foil stickers, regular stickers and rings to connect the pages. Here is a picture of what the kit includes and how the final product will look. I also had a chance to do a couple cards with some of the supplies, adding some additional items to complete the cards for Valentine’s Day. They are very similar. I added real red cardstock and some silver washi tape. On the one on the left, I stamped the lips and wording in real red and staz-on white ink. The stamps come from the new set Sealed With Love from the Occasions catalog just released. The one on the right I also added the real red paper, washi tape and only the small wording, but I also shaded the white heart and lines around with some Craft real red ink and then wiped some off. Paper Pumpkin is also running a special right now. If you buy a 3 month prepaid subscription , the price is reduced from $59. to $55. AND you will receive a FREE item from the Sale-A-Bration catalog. The items you can choose from include stamp sets, ribbon, designer Paper, card kit, and a tin to hold your cards. So if you have never tried Paper Pumpkin, now is a great time to try it. If you are already a customer, you can get a great deal on upcoming kits. This special deal lasts until March 31, 2017 but if you sign up today, you can start receiving your kits in February. To order this deal or any other items, please see my on line store at http://darleneseitz.stampinup.net or contact me directly by either leaving a comment on this post or send me an email at darstz@hotmail.com. In the Holiday catalog for Autumn & Winter, StampinUp introduced the stamp set called Paisleys & Posies. They have continued the set and it is still currently available. I have used the set for a Valentine’s card. The stamped background is from the set. This set is very versatile and can be used all year long. It also has matching framelits called Paisley Framelit Dies and this is also still available. It can be found in my On-Line Store under Carry Over products. When you buy both the stamps and the dies, you receive 10% off. My on-line store link is http://darleneseitz.stampinup.net. The heart die cut is from a retired die set but you can use any heart that you have available. The love die cut is from the Sunshine Wishes Thinlits Dies found in the Annual Catalog. These dies also have a heart that can be used on this card. This is also available in my on-line store. The paper and ink color are Real Red, and the ribbon is from our new Occasions Catalog and sold with white ribbon in a combo pack called Sending Love Ribbon Combo Pack. This ribbon is very thin so it is excellent for tying bows and knots. I adhered the die cuts with dimensionals and foam adhesive strips also available in my on-line store. The inside as shown above uses two stamps from a new stamp set called Sealed with Love which is found in our new Occasions catalog. It also has a matching die set called Love Notes Framelits dies. You can purchase separately or as a bundle and when you purchase the bundle, you save 10%. Also at this time, we currently have our Sale-A-Bration event going on where you can receive free products with a qualifying order. For every order of $50. you receive a free product of your choice from the Sale-A-Bration catalog. The items include stamp sets, ribbon, card kits, Designer Series Paper and more. If you do not have a catalog or demonstrator and would like a copy of both the Occasions Catalog and Sale-A-Bration, please leave me a comment here or email me at darstz@hotmail.com. You can also visit my on-line store at http://darleneseitz.stampinup.net to see these products. Darlene Seitz, Independent StampinUp demonstrator. P.S. Pictured below is a Birthday Card also made with the Paisley & Posies set.